Copyleft: This document is published under the terms of the Creative Commons Non-Commercial License. THE productive Expenditures are employed in agriculture, meadows, pastures, forests, mines, fishing, etc. to perpetuate riches in the form of grain, beverages, wood, cattle, raw materials for the handicrafts, etc. The sterile Expenses are made upon handicraft products, housing, clothing, interest on money, servants, commercial expenses, foreign commodities, etc. The sale of the net product which the Cultivator has produced during the preceding year, by means of the annual Advances of 600 livres employed in agriculture by the Farmer, furnishes the proprietor a revenue of 600 livres. The annual advances of 300 livres in sterile expenses are employed for the capital and the expenses of commerce, for the purchase of raw materials for the handicrafts, and for the subsistence and other needs of the artisan until he has finished and sold his product. Of the 600 livres of revenue, one half is spent by the Proprietor on purchases from the productive class, such as bread, wine, meat, etc., and the other half on purchases from the sterile class, such as clothing, furnishings, implements, etc. These expenditures may incline more or less to one side or the other, as the spender goes in more or less for luxury in the way of subsistence or luxury, in the form of ornamentation. Here the average situation is taken, where the reproductive expenditures renew the same revenue from year to year. But it is easy to see what changes would be caused in the annual reproduction of revenue, as the sterile expenditures or the productive expenditures became more or less important than the other: it is easy, I say, to tell this from the very changes which would take place in the table. For, suppose that luxury in the form of ornamentation should increase by a sixth in the case of the Proprietor, by a sixth in the case of the Artisan, and by a sixth in the case of the Cultivator, the reproduction of revenue would fall from 600 livres to 500 livres. If, on the contrary, an increase of expenditure of the same extent occurred in the consumption or the exportation of raw materials, the reproduction of revenue would rise from 600 livres to 700 livres, and so on. Thus we see that an excess of luxury in the way of decoration may quickly ruin with magnificence an opulent Nation. 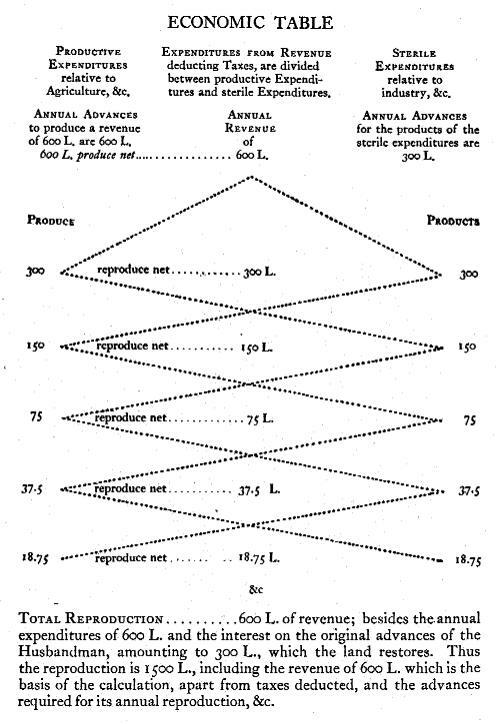 The 300 livres of revenue which were devoted to productive expenditures in the table bring back to this class, in money, advances which reproduce 300 livres net, which make up a part of the reproduction of the Proprietor's revenue; And by the distribution of the remaining sums which return to this same class, the total revenue is reproduced yearly. These 300 livres I say, which return to the productive class at first through the sale of the products which the Proprietor buys of them, are spent by the Farmer, half upon the consumption of products furnished by this same class, and the other half upon clothing, implements, tools, etc. which he buys of the sterile class. And they arise again with the net product. The 300 livres of the Proprietor's revenue which were devoted to sterile expenditures are spent by the artisan, half on productive expenditures in the purchase of subsistence, raw materials, and for foreign commerce; the other half is distributed among the sterile class itself for living expenses, and to restore the advances. This circulation and this reciprocal distribution continues by subdivisions in the same order, down to the last penny of the sums which pass reciprocally from one class of expenditures to the other class of expenditures. Circulation brings 600 livres to the sterile class, from which it is necessary to deduct 300 livres for the annual advances, leaving 300 livres for wages. These wages are equal to the 300 livres which this class receives from the productive class, and the advances are equal to the 300 livres of revenue which go to this same sterile class. The productions of the other class amount to 1200 livres, after deducting taxes, tithes, and interest on the advances of the Husbandman, which will be considered separately, in order to avoid undue complications in analyzing the expenditures. In the expenditure of the 1200 livres of production, the Proprietor of the revenue buys 300 livres of them. Another 300 livres goes to the sterile class, of which a half, or 150 livres, is consumed for subsistence by this class; the other half, or 150 livres, being taken for foreign commerce, which comes under this same class. Finally, 300 livres are consumed in the productive class, by the men who produce them, and 300 livres for feeding and care of the cattle. Thus of the 1200 livres of product this class expends 600 livres, and its advances of 600 livres are returned to it in money through the sales which it makes to the Proprietor and to the sterile class. An eighth of the total product enters into foreign commerce, either as exports or for raw materials and subsistence for the workers of the country who sell their products to the other Nations. The sales of the Merchant balance the purchases of merchandise and of gold and silver which are obtained from abroad. Such is the distributive order of the consumption of the native products among the different classes of citizens, and such is the idea we should have of the practice and the extent of the foreign commerce of a flourishing agricultural Nation. The reciprocal traffic of one class with the other distributes the revenue of 600 livres from one side to the other; giving 300 livres to each side, over and above the advances which are conserved. The Proprietor subsists by means of the 600 livres which he spends. The 300 livres distributed to each class, added to the product of the taxes, the tithe, etc., which are added to them, can support a man in one or the other class: thus 600 livres of revenue and the supplementary sums can furnish subsistence to three heads of families. On this basis, 600 millions of revenue can furnish subsistence to three million families of four persons of all ages each. The expenses furnished by the annual advances of the productive class, which also are renewed each year, and of which about a half is spent on food for the cattle and the other half in paying wages to the men engaged in the work of this class, add 300 millions of expenditures which can, with the part of the other products which are added to them, furnish subsistence for another million heads of families. Thus these 900 millions, which, not counting taxes, tithes, and the interest on the annual advances and on the original advances of the Husbandman, would be renewed annually from the landed property, could furnish subsistence to sixteen million persons of all ages, according to this order of circulation and distribution of the annual revenues. By circulation we mean here the purchases at first hand, paid for out of the revenue which is distributed among all the classes of men, excepting commerce, which multiplies purchases and sales without multiplying things, and which is only an increase of sterile expenditures. The riches of the productive class of a Nation where the Proprietors of the land have constantly 600 millions of revenue may be evaluated as follows. A revenue of 600 millions for the Proprietors assumes in addition 300 millions in taxes, and 150 millions for the tithe of the annual product, including all the charges, levied on those subject to the tithe: This makes a total of 1 billion 50 millions, including the revenue: In addition there are the reproduction of 1 billion 50 millions of annual advances, etc and 110 millions of interest on these advances at 10 per 100: making a grand total of 2,210,000,000 livres. In a kingdom having many vineyards, forests, meadows, etc. there would be only about two-thirds of these 2 billions 210 millions which would be obtained by the labor of the plow. This part would require, in a good State of large-scale cultivation carried on by horses, the employment of three hundred thirty-three thousand three hundred thirty-four plows at no acres of land per plow, three hundred thirty-three thousand three hundred thirty-four men to direct them, and 40 million acres of land. This culture may, with 5 or 6 billions of advances, be extended in France to more than 60 million acres. We are not speaking here of small-scale cultivation carried on with oxen, in which more than a million plows would be needed, and about 2,000,000 men to exploit 40 million acres of land, which would yield only two-fifths as much as large-scale cultivation does. This small-scale cultivation to which the Cultivators are reduced, from lack of riches to make the original advances, is carried on at the expense of the landed property itself, employed to a great extent for the expenses, and by excessive annual expenditures for the subsistence of the multitude of men occupied in this form of cultivation, which absorb almost all the product. This ungrateful cultivation, which reveals the poverty and the ruin of the Nations where it prevails, has nothing to do with the order of the Table, which is arranged on the basis of half of the employment of a plow, where the annual advances can, in conjunction with the fund of original advances, produce one hundred per cent. The interest on these advances should amount to at least 10 per 100, for the products of agriculture are exposed to ruinous accidents, which in ten years destroy the value of at least one year's crop. These advances demand, moreover, much up-keep and renewals; hence the total of interest on the original advances for establishing the Husbandmen is 333, 322,000 livres. The meadows, vineyards, ponds, forests, etc. require slight original advances on the part of the Farmers. The value of these advances may be reduced, including the original expenses for plantings and other work done at the expense of the Proprietors, to 1,000,000,000 livres. But vineyards and gardens require large annual advances, which, taken in connection with those of the other parts, may on the average be included in the total of annual advances set forth above. The total annual reproduction in net product, in annual advances with the interest thereon, and' in interest on the original advances, reckoned in conformity with the order of the table, is 2,543,322,000 livres. The territory of France could produce as much and even much more. Of this sum of 2,543,322,000 livres, 525 millions constitute half of the reproduction of the annual advances employed in feeding the cattle: leaving (if all taxes go back into circulation, and if they do not encroach upon the advances of the Husbandmen) 2,018,322,000 livres. This makes, FOR THE EXPENDITURE OF MEN, on the average 504,580,500 livres for each million heads of families, or for each head of a family 562 livres, which accidents reduce to about 530 livres. On this footing a State is rich, and men live comfortably there. 1. A bad system of taxation, encroaching upon the advances of the Cultivators. Noli me tangere is the motto of these advances. 2. Increase of taxes through expenses of collection. 3. Excess of luxurious expenditure on decoration. 4. Excess of expenses for litigation. 5. Lack of foreign trade in the produce of the land. 6. Lack of freedom in domestic trade in native commodities and in agriculture. 7. Personal vexations of the inhabitants of the rural districts. 8. Failure of the annual net product to return to the productive class.